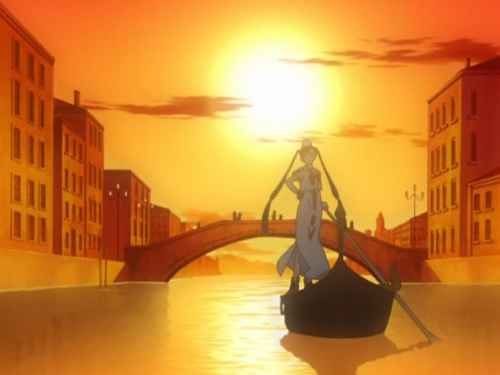 Though it borrows from the mythos of the (very real) city of Venice, there’s something pleasantly unreal about Aria. Rather, not unreal so much as there is a disregard for the idea and constraints of reality. Perhaps Aria seeks not to undermine reality as we know it, but in its ‘New Venice’, create its own sense of reality. 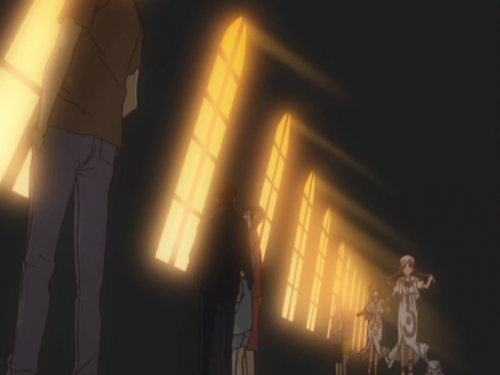 It’s plot and premise are rather understated, and the real focus of the show is the city itself. One finds themselves wondering what exactly they’re looking at, because, while the constituent elements of any given shot – a tree, some buildings – are grounded in reality, in tandem with the ever-present water they compose themselves like a surrealist painting. 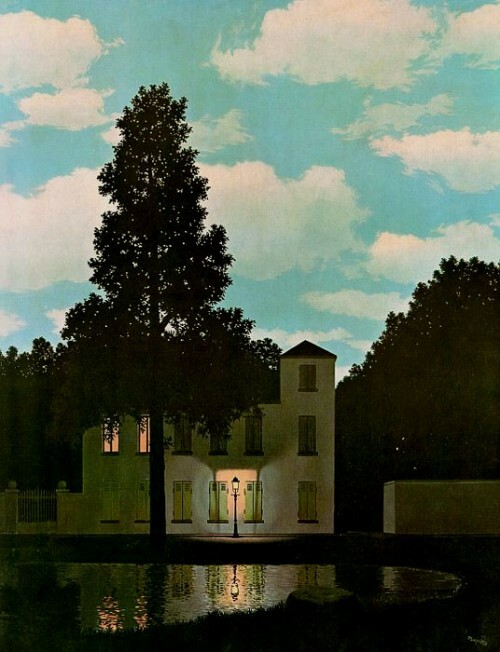 René Margritte’s The Empire of Lights offers us a scene which wouldn’t look out of place in Aria: a confusing, yet utterly appealing combination of elements (the nighttime earth and the daytime sky) create a space that both the mind and the eye question. Yet, as our brain almost always processes information coming from our eyes as factual, we have an inherent acceptance of the image, contradictory though it may be. There always seems to be an imposed sense of distance between the viewer and Neo Venezia. It’s a place to look upon, but never enter – imagining oneself roaming its canals feels like a violation. The city seems too pure for flesh-and-bones human beings to enter. It’s characters never progress past the point of caricatures or archetypes; they are simply a part of the picture being created. Neo Venezia is empty of real liveliness, instead replaced by a crystalline representation of liveliness, like mannequins in a store window. Normally, this is something our senses rebel against; however Aria‘s quiet hand shows us the beauty of this stillness. 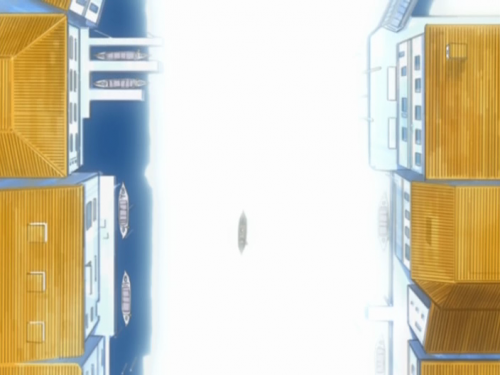 It always feels as if one is going to simply drift into the ocean when watching Aria. However, it controls its pace carefully, always guiding its viewers away from simply ‘zoning out’, and towards a more active contemplation. There’s an extremity of perspective continually at play in its visual language that seems, at first glance, out of place. Being in many ways the prototypical kuuki-kei (‘airy’ type, suiting for an anime who’s title means ‘airy’ in Italian) anime, the harshness of angles that these extreme perspectives provide is an unexpected move. They serve to jar us out of our lull, remind us of the fantasy of the situation. When the walls cease to line up at perfect right angles, we are forced to accept that Aria isn’t real. However, because it’s so gentle, we’re never mad. 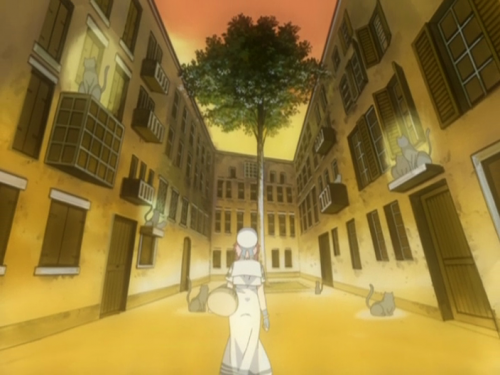 We simply look at the confusingly placed, yet familiar elements – cats, trees, a city square – and think to ourselves “isn’t this lovely?” Aria gives its viewers the gift of surrealism: the present of gazing upon something that reality simply cannot offer. It’s a joy to wonder what’s more solid, the ground, or the sea? That’s something I’ve not been able to place until now, but I think you’re right. Watching this, I’m always questioning why everything seems so perfect? Why are the characters all so kind to each other and why do they all get along so well? Neo Venezia is a perfect utopia and it doesn’t feel real; none of it does. It’s so nice, but it feels quite… lonely, too? I’m not sure that’s the right way to put it, but looking at these images, the lack of humanity is affective. What’s beauty without ugliness? We need to send Kino there to get a better of idea of what’s up! Alas, even though it is an illusion, I’m still happily submitting myself to its charms. It’s nice to dream, I guess. 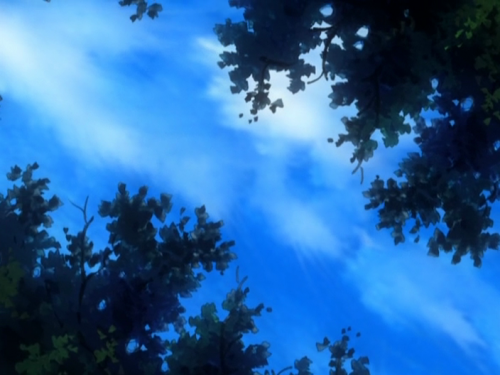 Anime is, in the act of presenting alternate realities and ways of living, escapist in nature. I don’t think there’s anyone who can deny that. While fringe elements like the crowd at Studio 4C try to push the boundaries of animation and anime as a medium, the actual content of that medium – the stories if you will – are still, ultimately, escapist things. Instead of acting as a mirror, and reflecting humanity back on itself (arguably, the realm of modernist art), Aria exists more like a traditional (or surrealist) painting; to be admired but never questioned. The harshness of angles that these extreme perspectives provide is an unexpected move. They serve to jar us out of our lull, remind us of the fantasy of the situation. Ah, this is a very interesting thought, one I hadn’t contemplated. 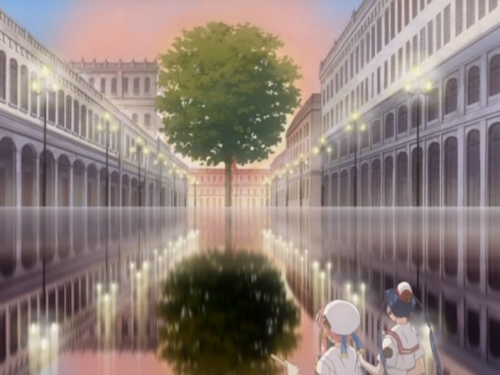 In my mind, it was the characters which I felt re-grounded my senses after continually getting lost in the dreamland of Neo Venezia (with musical accompaniment). 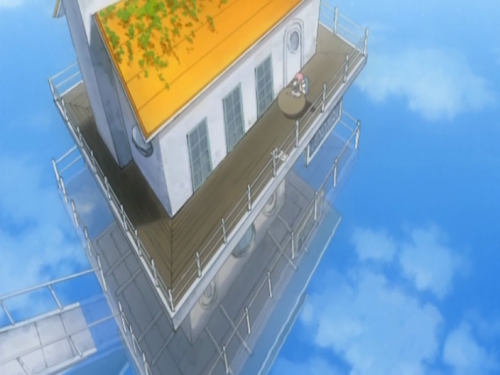 The lifeless world of architecture and water, dressed in sunlight, was fairly easy to escape into, with the one danger being the possible state of mindless euphoria, but the characters save us from this imo. Akari and the prez or Alice and Aika, they brought a human essence to the scape, which I felt kept a small bit of awareness in the experience. But they’re almost a little too humble, wouldn’t you agree? Nobody ever gets angry or upset; they’re all smiles and laughter. While I understand what you mean by their humility (their human traits and character ticks, if you will) they’re far from a grounding influence, in my mind.